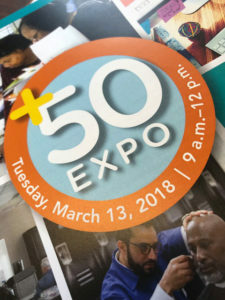 Susan H. Haberberger presented ‘Leaving a Positive Legacy’ at WakeTech’s +50 Expo on March 13, 2018 at the Northern Wake Campus in Raleigh. The event, designed for adults age 50 and older, attracted more than 200 attendees. In Sue’s presentation, she discussed the importance of planning for death and incapacity as a component to leaving a positive legacy and explained some related planning techniques and strategies often used to accomplish estate planning objectives. Sue is a Raleigh attorney and concentrates her practice in the areas of estate planning and administration and wealth transfer. She assists clients in the preparation, revision and updating of estate planning documents including wills, revocable living trusts, irrevocable life insurance trusts, powers of attorney (for both asset management and health care), and living wills. Sue also advises individuals on planning for and minimizing estate taxes, and counsels clients on the development of gifting strategies, including annual exclusion gifting and charitable gift planning. Sue also counsels clients on asset protection issues.